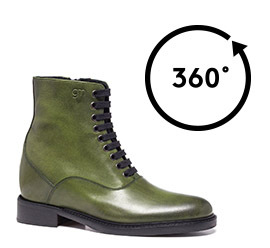 Handcrafted elevator boot with upper in green full grain leather and real leather outsole, able to increase height up to 4 inches. A boot with inner elevator system buffed by hand, by a distinctive vintage look for a summer rocker style. Limited edition.